Although I am not a story teller by nature, I am one by profession. Teaching is all about writing a compelling narrative with others. This is a story about opposites that come together to create a positive ending. In teaching, we learn to start with a ‘hook’ to every lesson. My hook for this story is a quote from John Dewey. If you wish to hear an audio recording of this blog post it is available HERE. Dewey’s model of education is a paradox to the image of the banking model presented by Paulo Freire in his Pedagogy of the Oppressed. Standards based, data driven, measured and counted learning events exemplify this notion of ‘banking’ education. The paradox is in who has the choice and voice in education. Dewey and Freire’s views of learning, when brought closer together and viewed through a lens of inquiry, aren’t far apart. The link between these two models is the connecting power of educational technology when ownership and authorship, within the ‘architecture of participation’ (O’Reilly, 2004) ensures that educational banking is controlled by those living the learning. Freire argues that education founded on a banking model – deposits of knowledge, collections of marks, returns on learning investments – goes against the narrative nature of what it means to be human. By “abandoning the educational goal of deposit-making and replace it with the posing of the problems of human beings in their relations with the world” (p. 79) we can regain our relationship, dialogue and actions with learning and each other. Teachers and students are creating and collecting their stories of learning as currency which is freely shared with others. Participatory, inquiry based learning is re-energizing the trend toward learner focused educational practices. This is supported by new and emerging technologies in the classroom. As modelled by many teachers in inquiry based classrooms, A. Dunsinger (Living Avivaloca) is one of many who exemplify Freire’s statement where teachers and students “become jointly responsible for a process in which all grow” (p. 80). Both Freire’s vision and Dewey’s model of education are in the process of becoming a reality. Through “problem posing”, education “affirms men and women as beings in the process of ‘becoming'” (p.84) and opens a dialogue that engages learners and teachers in the co-creation of their unique stories along the learning journey. This is the story of life itself. The stories of co-learning, problem-solving and success (or failure) add to the global narrative of what it means to be human. These stories of learning are being created, shared and celebrated through a collaborative network via the integration of technology (blogs, wikis, social media). 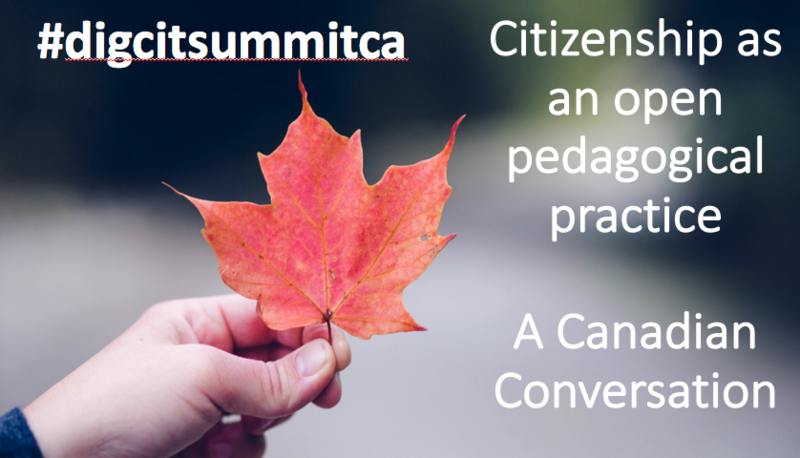 Providing teachers and students with opportunities to share the learning journey – from problem, through challenge, into comprehension, overcoming critique, and finding commitments – give both a place and space for authentic reflection. Freire states that “thought has meaning only when generated by action upon the world” (p. 77). Educational trends in flipping, tinkering, making, coding, creating, and gaming show that teachers and students are generating currency by co-creating their learning stories. These stories are being deposited and shared freely via digital networks. One current trend, that of digital badging, creates images of collecting coins as the currency of learning. As with earlier banking models of education, this trend can be a form of oppression unless the ownership of digital badges becomes part of an individual’s life-learning story. Collecting digital badges, just as collecting marks, can become the bitcoin version and driving purpose of education. From the Dewey model of education, digital badges have the potential to be images that tell the story of efforts, struggles, failures and triumph.Claiming the coin (or digital badge) and keeping the collection should be in the hands of the learner rather than the digital data banks that could deny or hoard educational opportunity. The paradox between banking models of education and the model of education as problem posing, life as learning will remain as polar forces, like the resisting ends of a magnet. Teachers and students, by weaving technology into solving real-life problems and sharing the stories of learning can find a balance between these two opposing forces. How are you balancing the forces – are you banking or sharing educational currency? Are you dialoguing and communicating about problems being solved? 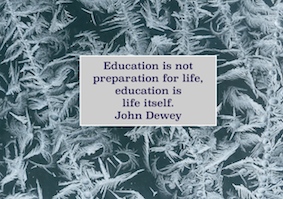 Do you conduct the business of learning or live the learning as life itself? Freire, P. (2006). Pedagogy of the oppressed, 30th Anniversary edition. New York: The Continuum International Publishing Group Inc.
Quote | This entry was posted in Learning, Talking and tagged Dewey, dialogue, education, Freire, inquiry, knowledge, learning, paradox, problems, sharing, teaching. Bookmark the permalink. 3 Responses to Stories to bank on! I lovelovelove this! Thanks for tagging me via Twitter. I love your phrasing re badges, coins, banking ( familiar idea, genius phrasing), and your suggestion it can still have potential for empowerment..l hadn’t thought of it before! Thanks – I’m standing in a divided space (academic practitioner) so wasn’t sure how to balance ‘critical’ and ‘pedagogy’. Feedback is VERY much appreciated!